efficiency of these techniques for discrimination of the two species is extremely variable. The simplest approach to obtain a synthetic competitor is the introduction of a short deletion or insertion in the center of the competitor. This variation in size, if maintained within an acceptable range (10-15% of the original size), does not modify significantly the amplification rate of PCR. Several methods have been proposed for the construction of this type of competitor. A rapid and efficient method for both DNA and RNA competitor construction is based on a modification of the overlap extension technique[1,2,4] (Fig. 1). Two DNA fragments are amplified in separate PCR reactions, using the designed external primers in combination with respective internal primers containing complementary sequences to each other. 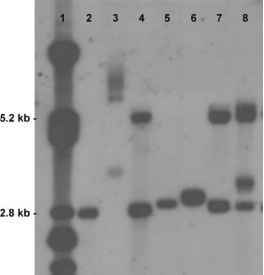 The two fragments are then annealed and amplified with the external primers, in the same tube. The resulting sequence is identical to the initial target, with the exception of the added (or deleted) complementary sequence used for the ligation of the two halves of the competitor. With a similar technique, it is possible to generate multiple competitors by ligation of different PCR products (see the chapter on multiplex competitive PCR). In c-PCR, quantification is performed by comparing the final, post-PCR signal of the target with that of known amounts of the competitor. By definition, in c-PCR, the most accurate measurement is obtained when the signals corresponding to competitor and target templates are equivalent (or close to equivalence).1-9-1 Ideally, if the target concentration is in the linear range of competitor/ target ratios, a single point could provide an accurate measurement of the target gene. However, because of the unpredictable target concentration, a variable number of tubes with a constant amount of target and variable competitor concentration must be analyzed in the same run. The number of the dilutions of competitor must be adapted to the requirements of the assay. In DNA assays, three dilutions in a 1 log range can be sufficient,[1,4] whereas for mRNA measurements, sometimes up to five tubes at 10-fold dilutions must be tested to cover the wide range of possible gene expression levels. In a second assay, the range can be restricted for a closer quantification of RNA levels. Finally, an improvement in accuracy of c-PCR can be obtained performing a simultaneous amplification in the same tube of the target gene and a reporter gene.